Praying Mantis has been around for quite some years. 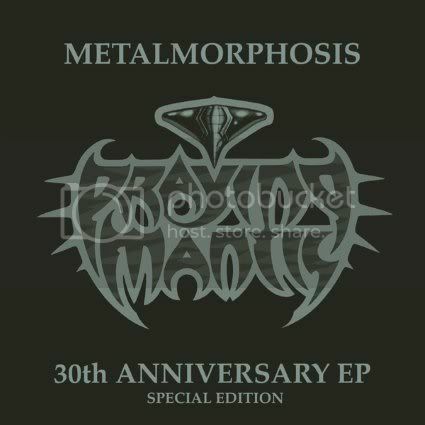 They celebrate their anniversary, with releasing this five track LP, which are all older songs ‘metalmorphosed’ to 2011. The band dates back to the NWOBHM highlight years, nice to know the band is still around. They tend to be quite melodic and people might often refer to Iron Maiden when speaking about these guys. Maybe that link is plausible, but yet they tend to put the stress on slightly different things. As mentioned before, the sound is a bit more melodic and therefore catches also the late 80’s sound. Whether their ‘Metalmorphosis’ worked out, is not to question. The songs have their old structure, but clearly are modernized and this makes it sound like they could have been written new. On vocals, Mike Freeland, has done a decent job, he was not the original vocalist of the songs which makes the comparing even more relevant, but he gives his own twist to the songs and although his voice is not the most outstanding, it is pleasant to listen to him. “Metalmorphosis” became an album of 2011 instead of a remake of old songs, that speaks for the band. For those who have not heard the band before, it may even be hard to notice. Nice release and worth to have in your collection. Just a pity that is only 5 tracks.